BANGUI, CENTRAL AFRICAN REPUBLIC (ANS – Nov. 21, 2018) — An attack on a Cathedral in the Central African Republic has left at least 40 people dead. 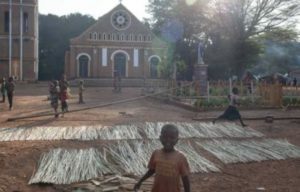 More than 40 people are believed killed in the attack on the Sacred Heart Cathedral in Aliandao town, Central African Republic (CAR), 200 miles east of the capital Bangui. On November 15, the Cathedral and its surrounding properties, a camp for internally displaced persons (IDPs) and the Bishop’s residence came under attack by armed assailants, according to Christian Solidarity Worldwide. The IDP camp, which had capacity for 20,000 people, was razed to the ground. Some reports indicate that those who were killed in the camp were unable to escape from temporary structures that were set on fire. The Cathedral and its surrounding buildings were looted and residential properties nearby were also looted and burned. CAR’s civil conflict assumed a religious dimension in March 2013 when Seleka, a predominantly Muslim rebel coalition, took power in a coup, suspending the constitution, dissolving the government and National Assembly, and eventually installing one of its leaders, Michael Djotodia, as president. In September 2013, Djotodia officially disbanded Seleka; however, many rebels refused to disarm and sectarian violence increased. Sustained and severe human rights violations during the civil conflict eventually resulted in retributive violence following the emergence of anti-Seleka groups commonly referred to as ‘anti–Balaka’. Although the anti-Balaka groups have been widely described as “Christian militia,” they are in reality composed of pre-existing village defence groups bolstered by former soldiers loyal to deposed President Bozize, former Seleka fighters, angry youths seeking revenge for Seleka violations, and common criminals.